Answer: To remove red-eye, resize, crop, rotate, lighten or darken or apply fun effects to any digital photograph. Personally, we use Photoshop for all this. But not everyone has access to such a program. And, it’s so good, that it’s almost too complex and can be overkill for just the basic edits you need to do on a regular basis. I have not used this one, but it is very highly regarded by professionals and amateur photographers alike. 95% of the stuff you’d do in Photoshop, you can do in Picnik more easily. Grab photos straight from your Flickr (and replace them with edited versions), from your computer, or the web; send your edited photos to your blog, to email, photo sharing sites, make a nifty slideshow, or even have them printed. Picnik is fast. Better, it’s easy peasy, free, and filled with friendly features. We’ve been on the lookout for a halfway decent online photo editor for a while, and we’ve test-driven more than we care to admit. We’re done looking. Using Picnik is nicer than lying on a blanket in a grassy field on a sunny day. This is the program I use to organize all my photos on my hard drive. It’s completely AWESOME. I use the $30 paid-for program, rather than the free version. Many computers & software bundles these days come with the free Adobe Photoshop Album Starter Edition. Try it! It’s great because you can edit and organize all your digital photos right in one place. 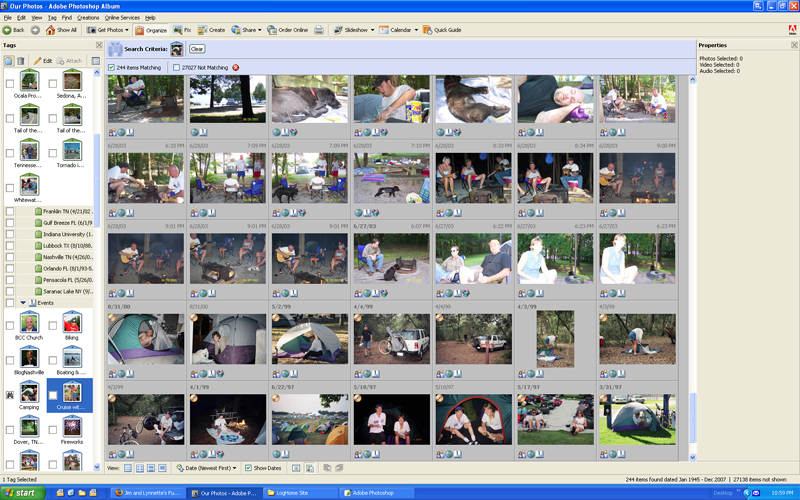 For years, Picasa has gotten rave reviews — for everything ranging from its simplicity to its versatility. I think it’s a great basic photo editor. The best part: You can tag and organize all of your photos right in the same program! You can also make some or all of your albums publicly viewable, so others can share or download your photos — which is great for friends and family members after a trip or special occasion. Picasa is the program I’ll probably be switching to once Adobe Photoshop Album goes away. This one’s an online photo editor, which means you can resize your photos on-the-go or from any computer. No software required, just bookmark this site. The Pixenate program also offers a handful of cool photo editing enhancements (red-eye, sepia tone, rotate, etc). TIP: If you’re looking at different online photo editors, I would encourage you to find one that has something like “preserve aspect ratio” or “constrain” or “keep proportions” as a photo-resizing option. That way, if you know you want your picture to be 160 pixels on the longest side, then it will proportionally resize the other size for you. Few online photo editors do this.